To create an exemplary new high performance 73,000 SF learning environment using the USGBC LEED-NC rating system to guide and evaluate the project. 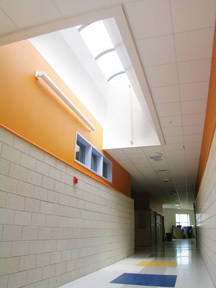 Architect, Stephen Blatt and Daylighting Consultant, Gunnar Hubbard decided to use a system of skylights to integrate daylight into the learning environment. In the main lobby they chose Wasco’s Double Dome Barrel Vault skylight (20’ x 8’ 3”) to create a park like room. In one of the school’s two cafeterias Wasco’s Double Dome Barrel Vault (8’ x 4’ 3”) skylights provide most of the natural light. Another Wasco Double Dome Barrel Vault (16’ x 4’ 3”) skylight provides supplemental lighting to the corridor outside the gymnasium. 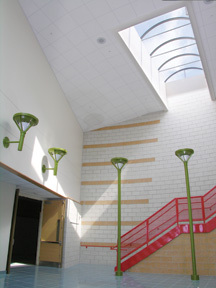 Four Super Thermalized Solar Energy Sky Domes (4’ 7” x 4’ 7”) provide natural lighting to the music room and the stairwells. The result is an energy efficient design with flexible light-filled spaces. Stephen Blatt Architects is a small, versatile firm with concentrations in educational, residential, and institutional facilities. The company has a staff of seven licensed architects, an interior designer, and a highly skilled team of CAD operators who offer clients comprehensive planning and architectural services. Stephen Blatt Architects has received many Excellence in Design Awards from both the Maine and New England Chapters of the American Institute of Architects. The company’s work is frequently published in both periodical and hardcover publications.